It is important to explain why the city has been grappling with these issues for so many years and why we need a solution. Without the proposed contracts, we will continue with our present conditions, which include a loss for the city of 3 percent towards CalPERS pension contributions in 2017 and NO employee contributions towards OPEB. These proposed contracts benefit the city because they provide for public safety employees to continue paying 15 percent towards CalPERS contributions and up to 4 percent in employee contributions towards OPEB. If a successor agreement isn't in place by the end of 2017, public safety employees would go from paying 15 percent (9 percent employee share plus 6 percent of the city's share for a total of 15 percent) back to 12 percent. That's a loss for the city of 3 percent. It also would not include any employee contribution toward OPEB. With the current landscape now in view, let’s move on to the facts. The proposed contracts guarantee police and firefighters will continue to receive annual raises over the next six years. We should also keep in mind that during the recent economic downturn, Alameda police, Alameda firefighters, and all other city employees went seven consecutive years without any raises. When they did eventually receive an increase, city employees’ salaries only rose an average of 0.56 percent each year for that 10-year period. Approximately two years ago, the city proposed using tax revenue growth to calculate raises for all city employees, not just public safety. Agreeing to use this formula to calculate raises was a risk for all of the city's bargaining units to take. All other cities in the Bay Area get fixed cost of living raises, including cities that were surveyed in the chart below. Note that Alameda ranks fifth among the agencies listed. This year’s and next year’s salary increases have already been decided as part of the existing contracts. The proposed extension would guarantee a minimum of an 11 percent increase over the life of the contract and a maximum of 20 percent over the next six years. In these proposed contract extensions, no matter what the increase is, whether minimum or maximum, the employees would still have to pay a large percentage of it back to the city for their pension. Public safety will contribute more towards pension in the proposed contracts, more than is currently contributed, and more than almost anyone in the state of California contributes. If the contracts are approved, public safety’s pension contribution will be increased to 15 percent of each employee’s salary through the year 2021. Under the 2013 state pension reform act, each city can only require workers to pay up to 12 percent of their pension costs if successor agreements are not in place. Some have been concerned about “pension spiking.” Alameda public safety contracts do not allow “pension spiking.” In fact, there is now state law that specifically addresses “pension spiking.” The Pension Reform Act was not enacted in time to be included in the last contract. The proposed contracts will be consistent with that law. The contract language reads: "Employees who constitute classic members of the city's defined benefit plan will have their final compensation for pension purpose calculated based on a formula that defines final compensation on a 12-consecutive month period in accordance with Public Employees' Retirement Law." This language will make “pension spiking” impossible. Finally, it is important to understand the proposed change to health care. These contracts would secure and extend the current agreement that active employees split the cost of increases for their healthcare 50/50 with the city. It also guarantees important changes to retiree health care. First, for the first time in the history of retiree health care, all active public safety employees will contribute 4 percent of their salary to a trust. The trust will be funded over the next several years by employees as well as by the city and in 2019, the trust will take over as the revenue source for health care for retirees. This is in addition to the structural changes that have already been addressed with the past contracts that include increasing the time it takes for an employee to earn retirement benefits from five years to 10 years, limiting the cost of an individual's plan, and changing the retiree health benefit for employees hired after 2011 to the employee only, with spousal retiree health care being dropped. The proposed contracts are a result of countless hours of collaboration between employee groups and the city to solve a problem that the city has been concerned with for over 15 years. The contracts include contributions by all parties. The city will contribute funds, but we should not forget that each employee will contribute 19 percent (15 percent to CalPERS and 4 percent to the health trust) of salary to health care and retirement. This 19 percent contribution will take place through the entire term of these contracts regardless of how the city performs financially. We believe these contracts and the health care trust will continue to allow the city to meet the obligations its leaders have already made, continue to see budget surpluses, and a maintain a healthy reserve fund, as the case has been for the last several years. It would be nice to see some more macro-level data in that table - like how do the cities compare on firefighter costs in proportion to population and city budget. 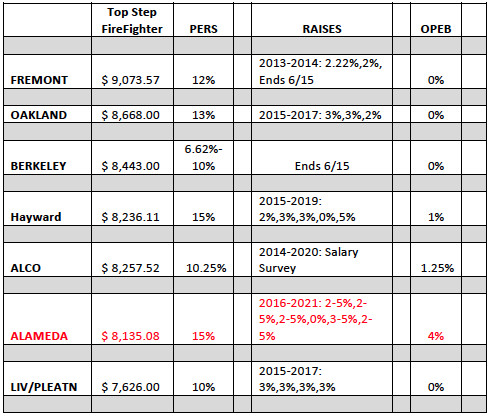 But let’s assume that had Mr. DelBono compared total pay across these cities, Alameda firefighters still ranked near the bottom. So what? Is Mr. DelBono suggesting that Alameda can no longer recruit or retain qualified fire department personnel?